gobs of security updates for Adobe and Microsoft products, including Windows, Office, Flash Player, Photoshop, Reader and Shockwave. In other news, Adobe Shockwave still exists. Canadians have been bilked out of more than $360,000 by phone scammers who pressure victims into paying bogus “tax arrears” at Bitcoin ATMs. You can bet they’re calling U. S. taxpayers, too. In other news, there are Bitcoin ATMs. As the shopping season shifts into high gear (big retailers are now pushing early “Black Friday” deals), here are some tips on how to haggle with an online seller for a better price. Intel and AMD, life-long rivals, are teaming up to make an integrated chip package that will combine an Intel Core microprocessor with AMD Radeon graphics hardware. The dog-and-cat partnership aims to compete with graphics powerhouse NVIDIA. 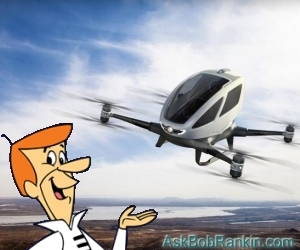 NASA has inked a contract with Uber to develop ride-sharing and traffic control software for intra-city “flying taxi” services that don’t exist yet. "Beep, beep, beep, bonk." A driverless shuttle bus on the Las Vegas strip got its fender dinged by a delivery truck because, although the bus “saw” the truck slowly backing up, it was not programmed to move out of the way. Self-driving cars (and trucks and buses) may have to talk to bicycles in order to predict what the latter’s self-absorbed riders are going to do next. “Clear Session” is a handy app for Chrome browsers that clears cookies, local storage, and session storage only for the web page you are currently visiting. It’s a quick way around paywalls that allow you only a few page views per month, or to restore pages that become unresponsive. “I don’t know how I did it. I just like messing with Dad’s phone. I don’t know where Paris is or what the Eiffel Tower is,” claimed a 9 year-old girl after booking a $1200 Disneyland Paris vacation for her family. Pleading ignorance is for politicians, sweetie. Equifax’s CEO announced that he and other executives won’t get performance bonuses this year; not because they leaked the private data of nearly every adult American, but because they missed profit goals by miles. I have a feeling they'll miss next year's profit goals as well. Ford Motor Co. is testing bionic exoskeletons that will, hopefully, leave its assembly line workers less exhausted and broken at the end of their shifts while increasing productivity. The soccer ball that will be used in the 2018 World Cup tournament includes a microchip that will broadcast the ball’s speed and trajectory to the sidelines, where the data will be tracked and analyzed. But will the Telestra 18 ball also place a wake-up call to spectators’ phones when a goal is finally scored? McSolved! Raina McLeod loves her McFlurry. But apparently, the McFlurry machines in McDonald's restaurants are frequently out of McOrder. So McLeod, a writer, built an app to direct users to McDonald's locations with working McFlurry machines. Way to harness the power of the McCrowd, McLeod! Watch out, IKEA! Amazon has unleashed a line of not-so-basic home furnishings called Rivet that includes free shipping for Prime members and optional in-home assembly service; the technician will even haul your old couch away. Google has notified the makers of several thousand Android apps that they have 30 days to explain how their apps use Android’s Accessibility Services to help the disabled, or be booted from the Play store. It seems the services can be exploited to hack phones and install malware. Most recent comments on "Geekly Update - 15 November 2017"
Perhaps autonomous vehicles should be programmed to sound the horn when it's stopped and something else is heading toward it on a collision course. I wonder how long it will take soccer teams to hack the ball and use the info to their advantage during the games. motorcycle operator I can testify that anything smaller than a car is functionally invisible to many drivers. On numerous occasions I have had people look straight at me and then continue to pull out or move into the space I was occupying. Its possible self-driving cars might actually be safer to bikers. Those tax scammers have been calling me once a week for about three months. I hope there's a special place in h*ll for them. NASA/Uber: Why would NASA, and NOT the FAA, be involved in Traffic Control software? That is, specifically, the purpose of the FAA. Weird. Cool, but weird. Driverless Shuttle Buss: not moving out of the way. LOL! McSolved: Bob, did you mean to end with "power of the McCLOUD, McLeod! ", and not "power of the McCrowd, McLeod!"? since you were intending not only a play on WORDS, but also the same sound in both words. Right? EDITOR'S NOTE: I was thinking of crowd-sourcing, but I like yours too! "Self-absorbed" and "bicycle riders" don't necessarily go hand-in-hand.